I posted last month about my bike dilemma. 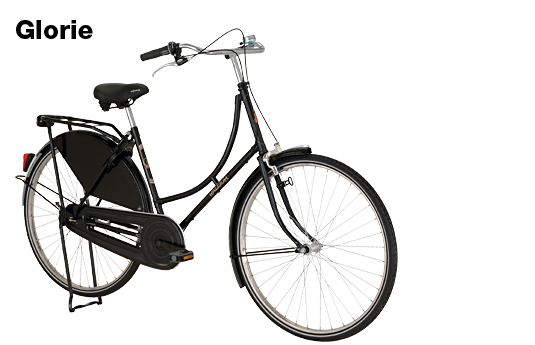 I almost pulled the trigger on an Azor Oma, but I decided to see what was available in Denmark before buying a bike stateside. Initially, I was hellbent on having a Dutch bike, but after contacting several retailers in Netherlands, I was unable to find a shop that was willing to ship to Denmark. 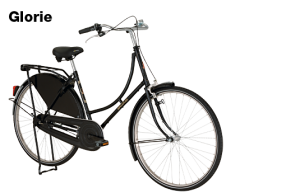 I did find a retailer in Germany that would ship a Dutch bike to Denmark, but they weren’t forthcoming with the brand info on their bikes and since I’m buying online sight unseen, I didn’t want to end up with a Dutch-built Huffy. I looked in Denmark, but the prices here were considerably higher than than the prices in Germany and Netherlands for the same bikes. Probably due to the 25% VAT. Then, I found THE bike. It’s a Raleigh Glorie. It’s based on 1920’s designs, and it’s only sold in Denmark. The tiny bit of snob in me smiles at having a bike with an exclusive Scandinavian pedigree that’s not available for import in the US. But more importantly, it’s a no-nonsense city bike for the way people ride over here: 3 speeds because we don’t need 7, some people ride with one; fenders, skirt guards and an enclosed chain case because we ride everyday, often in dresses and high heels; coaster and handbrakes because we ride in traffic; an integrated lock because we need to park our bikes in the city and at the train station; and unlike most European bikes sold in the US, it’s not too pretty and precious to ride in the snow and rain. Could this red be anymore stunning? Probably not. I love red and I love this bike in red, but this bike will replace my car, it will be ridden hard, locked up next to other bikes, and left out in the rain. How will it look in a year’s time? Black is classic, but not nearly as stunning as the red. However, most people in Copenhagen (and Amsterdam) ride black bikes and the rust and chipped paint give them a sort of patina that I think only adds to their beauty. 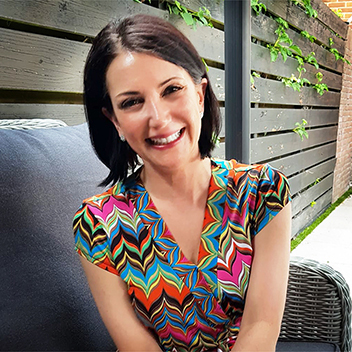 So, my lovely blog readers, what do you say? 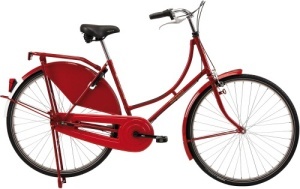 Is my Raleigh red or black? I say red! you can be practical any other time, but think how happy it will make you every day to get on that bike!! I love love love the red! Besides, a bike can always be repainted. Definitely RED. Who wants to look like everyone else?